Faced with a dire need to protect access to justice for all citizens of the commonwealth, attorneys and judges last month urged legislators to protect the court system during the MBA-sponsored Lobby Day for Court Funding. Kathleen M. O'Donnell, a longtime MBA member and officer who is associated with the Marcotte Law Office in Lowell, has been nominated as Massachusetts Bar Association president-elect for the 2003-2004 association year. She will become president in September 2004. 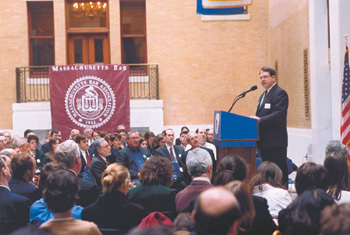 MBA President Joseph Vrabel addresses an overflow crowd at the start of the fourth annual Walk to the Hill for Civil Legal Aid on March 5 in the Great Hall of the State House. State funds for legal services face a 33 percent cut under Gov. Romney's budget plan.